Lets assume that you want to upload and share a 100 MB file with your fiends using an online file sharing service. But the file sharing service allows you to upload up to 10 MB at a time. How to do you split the big file in to multiple chunks and upload it to the file sharing service? There are many tools available online for free to do the job. But WinRar is the best free application to not only split big files in to several chunks but also to compress them while splitting. Another reason to choose WinRar over other splitting software is its popularity. As WinRar is widely popular most of your friends may be having an installed copy. So they need to look for special software when they need to merge the files. 1) Right Click on the file that you want to split and choose the option Add to archive. 2) WinRar automatically assigns a name for the new archive it is going to create. If you are not happy with that name change it as appropriate. 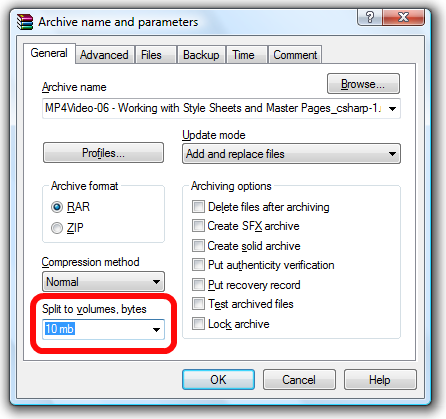 3) Under the option Split to volumes, bytes, either enter the desired maximum size of each file chunk or choose an appropriate size from the available drop down option. In our case lets enter 10 MB. 4) Click Ok and wait for few seconds. WinRar compress the source file and splits it in to several files. i tried this but it did not compress the files, although it did split them. please can u tell me how to compress it in very small size? Thanks for the instructions. It really helped. can u say me how 2 hack the serial key for any software…….